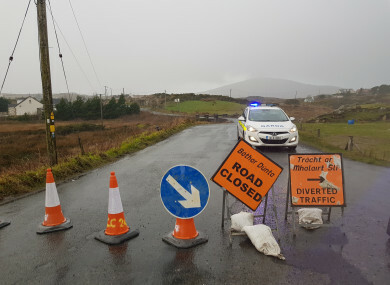 The scene of the crash in Gortahork, Donegal, yesterday. THE FUNERAL ARRANGEMENTS have been announced for the four young men who died in a car crash in Co Donegal on Sunday night. The men, all aged in their 20s and from the local area, will be buried on Thursday. Shaun Harkin‘s funeral mass will take place in Christ the King Church, Gortahork, at 10am on Thursday with burial afterwards in the adjacent cemetery. Mícheal Roarty‘s funeral mass will take place in the Sacred Heart Church, Dunlewey, at 11.30am on Thursday with burial afterwards in the adjoining cemetery. John Harley‘s funeral mass will take place at St Finian’s Church, Falcarragh, at 1pm on Thursday with burial afterwards in the adjoining cemetery. Daniel Scott‘s funeral mass will take part in Christ the King Church, Gortahork, at 2.30pm on Thursday with burial afterwards in the adjacent cemetery. The families’ wishes regarding visiting times can be read at the above links. Tributes have been paid to the men since the tragic accident, with members of the local community rallying around their families and friends. Comhbhrón le Clann Uí Rabhartaigh, is le teaghlaigh na gasúraí a cailleadh go tragóideach aréir. Tá ar smaointe le nár gcairde i CLG Chloich Cheann Fhaola ag an am seo chomh maith. John Horan, President of the Gaelic Athletic Association, said he was “truly saddened” by the news and offered his condolences to the men’s families and friends. It is heartbreaking to think that these four young men, in the prime of their lives, had their lives taken from them so soon. “On behalf of the GAA I would like to extend my sympathies and condolences to the victims’ families, teammates, clubs, and wider circle of friend,” Horan said. Emergency services were called to the scene of the single-vehicle collision on a road near Magheraroarty, Gortahork, shortly before 9pm on Sunday. The four men, who were travelling in one car, were pronounced dead at the scene a short time later. The cause of the crash is not yet known. Sinn Féin councillor John Seamais Ó Fearraigh told TheJournal.ie people in the area are “devastated” and “totally numb”. Four young men have lost their lives, it’s a huge tragedy. It’s just devastating for all the families and all the friends as well. Gardaí have appealed for witnesses to the incident to contact Milford Garda Station on 074 915 3060 or the Garda Confidential Line on 1800 666 111. Ten people have died on Irish roads since Thursday. Chief Superintendent Finbarr Murphy of the Garda National Roads Policing Bureau said the force was “deeply saddened” by the death toll on Irish roads over the past week. “I want to take this opportunity to send our condolences to all of those affected by these tragic events,” he added. Email “'It is heartbreaking': Funeral arrangements announced for four young men who died in Donegal crash ”. Feedback on “'It is heartbreaking': Funeral arrangements announced for four young men who died in Donegal crash ”.